Royal Canadian Mint (RCM) 10 oz. silver bars represent ideal options for those who wish to invest in larger amounts of silver than afforded with purchasing multiple single 1 oz. bars or paying for the much larger 100 oz. silver bars. RCM bars are also trusted by investors around the world and are therefore easily liquid. But those aren’t the only reasons investors love RCM silver bars. IRA Eligibility – Enjoy the combined profit potential and tax benefits of buying RCM silver bars for your individual retirement account. Government Backing – These silver bars are manufactured by the Royal Canadian Mint and are guaranteed by Canada’s government. Virtually Pure Silver Content – 10-ounce RCM silver bars are 99.99% – that’s four 9s – pure. Wide Recognition – The distinctive RCM logo is stamped on the bar along with ingot’s purity, weight, and serial number to ensure authenticity. 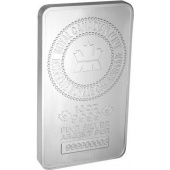 Easy Liquidity – While most silver bars are made by private mints, the RCM bars are government backed and produced. Investors around the globe trust RCM silver bars, which means liquidating them is a breeze. Real Wealth – Precious metals like silver are a hedge against inflation and insurance against disaster, and physical silver is a tremendous vehicle for protecting yourself against changing economic winds and international travails. At Universal Coin & Bullion, we know that not all silver bars are created equal. That’s why we don’t sell just any RCM silver bars. Our team is led by “America’s Gold Expert” himself, Dr. Michael Fuljenz. An award-winning author and national speaker who has appeared on Fox Business News and Bloomberg TV, Dr. Fuljenz evaluates the silver bars that enter our inventory and ensures that each meets his high standards or quality. The RCM silver bars you order from us will contain only a minimum of nicks, gouges, and scratches – the types of flaws that can eat away at the precious metal silver content in each bar. Rest assured, when you invest in silver bars from Universal Coin & Bullion, you’ll enjoy a worry-free experience from the time you place your order through the point that you’ve received it and beyond. We ensure every customer enjoys 100% satisfaction with our products and services, and our customer care team stands by to help you with your order in any way necessary. Placing a large online order? You’ll receive free shipping on any online orders totaling more than $99, and this can help you maximize your investment dollars. No matter the size of your order, it will be shipped in secure, discreet packaging to ensure its safety. Peace of mind throughout every stage of bullion investing is what we’re all about at Universal Coin & Bullion. This commitment to providing our customers with an unparalleled experience has helped us earn and proudly maintain an A+ rating with the Better Business Bureau. There’s no time like the present to begin investing in silver or to further fortify your precious metals portfolio. So, call us today at 800.822.4653 to invest in RCM 10 oz. silver bars before prices soar.